Many moons ago (around 1977) I was introduced by a local friend to the joys of wargaming. At first we were limited to the old WW2 and Napoleonics Airfix ranges. As things moved forward we widened our remit to Lance (?) a medieval game and to the WRG Modern ruleset. I still have the old Heroics & Ros Russian and British Battlegroups. I even found an old advertisement carried in military modelling – the tanks were 12p each. 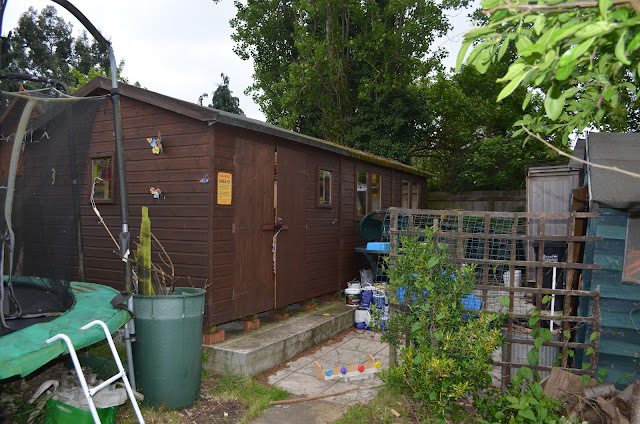 I was very fortunate, my parents in their wisdom decided that a large shed/den at the end of the garden was the answer to getting me and my brother out of the house when our mates came round. The shed was an old school classroom (very cold in the winter) but more than suited our purposes. In the middle stood a cantilevered table that was 6ft wide and about 10ft in length. It saw plenty of action ! During this time I used to mix my wargaming with roleplaying and for almost 10 years we played every Wednesday night and Sunday Afternoon. Life couldn’t be better. Work, Family and everything else saw my hobby take a break for about 10 years. In 2000 I re-ignited the fire and joined a group playing down in Farnborough. 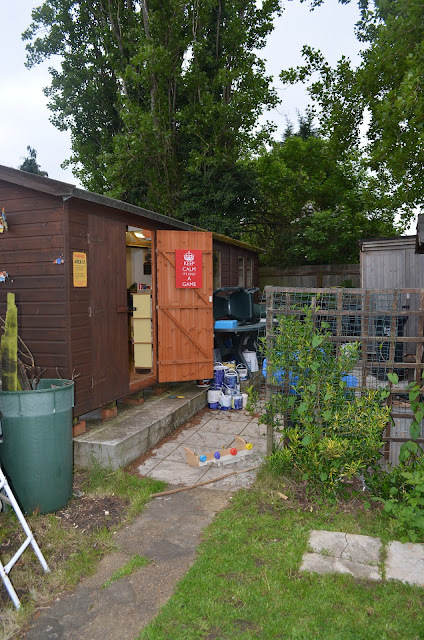 Twelve years later I have installed a games shed in my own garden, painted 1000's of figures and built tables of terrain. 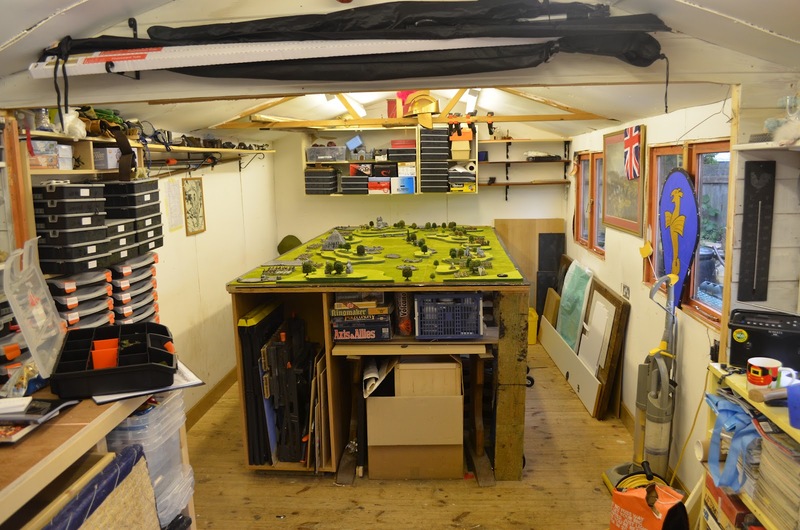 In this time I have built quite a sizeable wargaming collection. I decided quite early on that I would focus on two scales, 28mm and 10mm. This gives me the variation of large ‘epic’ engagements and the skirmish warfare. 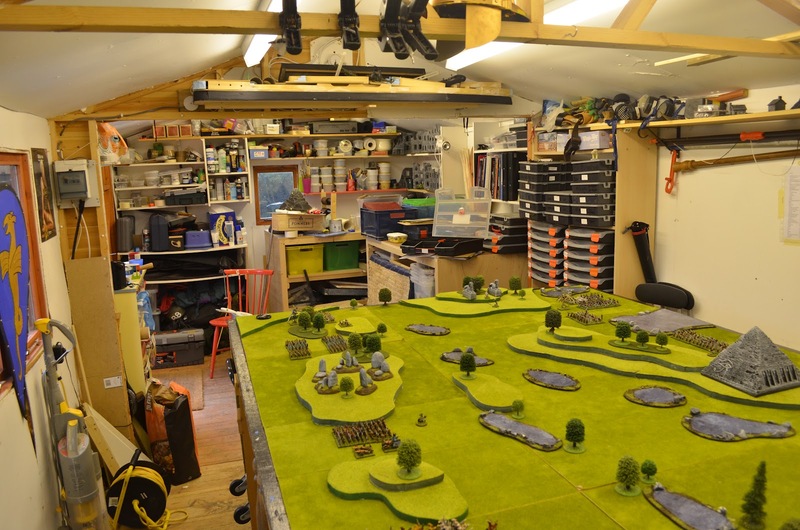 For 10mm much of my gaming was originally focussed on Warmaster (Fantasy) – I quickly built armies for Empire, Elves, Dark Elves, Barbarians, Orcs, and more recently undead. With these I have fought several battles with likeminded souls. When Warmaster Medieval came on the scene I invested heavily in a medieval army (s) painting over 4000 individual figures in 3 months. To date these troops have fought in a number of Hundred Years War engagements and a full War of the Roses campaign (based on the old Kingmaker board game). At present I am putting together a dark ages force of Normans, Saxons and Vikings. With an investment of over £300 in lead I will eventually finish these off. Most of the figures purchased for these armies have come from Kallistra, Pendraken and a few of the beasts from Games Workshop. When one of the group set up a 10mm Zulu army I was spurred into creating an opposing force – now I can put together 4 battalions of British Line, a couple of lancer and cavalry regiments plus a host of Boers, Guns and Rockets. These were all sourced from Magister Militum. Finally 10mm is all about BIG battles and what is bigger than Napoleonics. I went a bit overboard here and can field in excess of 40 battalions of French line, guards and legere, about 30 regiments of cavalry (I have used them all) and over 40 guns ! Opposing them are British & Allies again a similar amount painted. All told I reckon about 8000 little men have been painted to date to meet my Napoleonic dreams. From a terrain point of view 10mm is very straight forward, roads, rivers, fields and woods are all scratchbuilt. With only trees and buildings coming from a variety of sources. All my 10mm games are based in a European context – so ne deserts, jungles or arctic surroundings. To balance this big battle approach I embarked not so long ago in 28mm games. It was the terrain building side that has driven me.